Archery is an Olympic Sport, hunting skill, and classic camp activity. 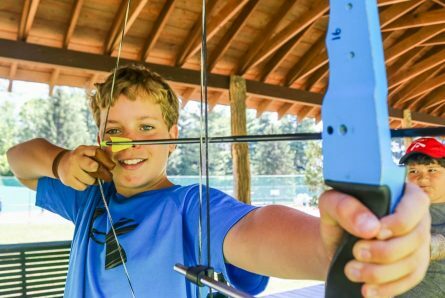 Archery appeals to a camper’s sense of adventure, and it invites him into an ancient and living tradition. Archery allows him to learn a historic and primitive skill that has been employed by people around the world and across time. From native American hunters to mythological heroes, the strength, patience, and steadiness required to shoot a bow have been important skills. For modern hunters, the use of a bow is a way of enhancing the sport. 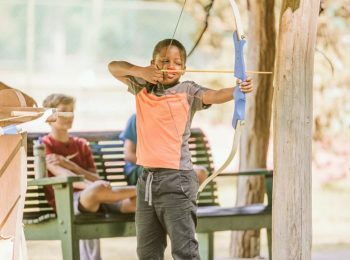 At Rockmont, archery has always been near the center of camp. The range is just below Arrowhead Lodge, adjacent to the Tennis Courts. A shaded platform makes it enjoyable to concentrate on the finely-tuned skills required to advance in the skill. 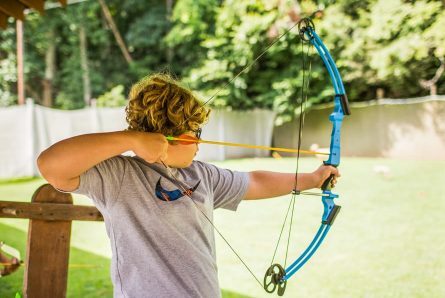 Our equipment includes both traditional recurve and long bows, as well as modern compound bows, sized for campers of all ages. 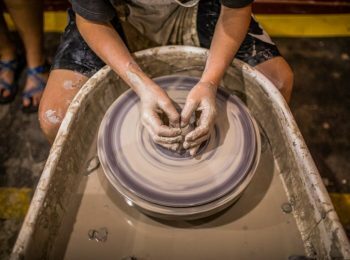 Our emphasis is on form, technique, and focus. The archery range mantra is “Aim small, miss small,”. 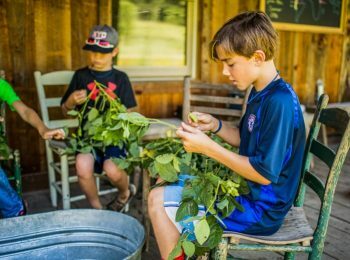 Campers learn through practicing this ancient art that concentration and focus are powerful and important skills. 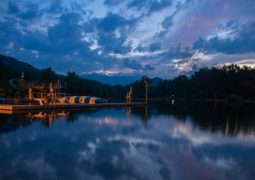 Rockmont’s Brookside Gym is in the center of camp, perched above the waterfront. The gym is used for many fun and rowdy gatherings, but when the skills bugle blows, Brookside becomes the home of Rockmont basketball. Rockmont basketball is about teamwork, encouragement, challenge, skill development, and as always, growth. 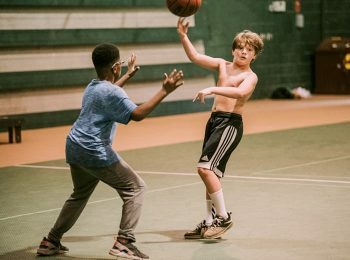 Many alumni fondly remember Brookside as a place where they truly came alive through a unique combination of joyful friendship and serious basketball. 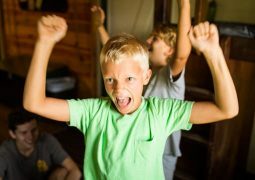 There a camper can grow in his own skills, but he can also grow in his recognition and awareness of others. 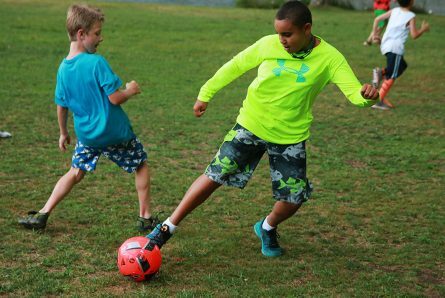 Through an assortment of lively games and activities, we teach the fundamentals of dribbling, passing, shooting, and team play. Then, we scrimmage. This is a great chance to pick up the game, or to to go deeper into a game you already know and love. 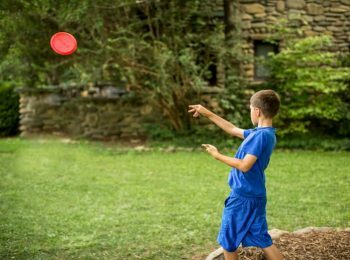 We have been playing disc golf at Rockmont since before the invention of Disc Golf. The original course was designed by David Bruce and Johnny Klutz in 1976. It featured 18 birdhouse-shaped targets of varying par lengths. The course record is held (or claimed) by David Bruce. Disc Golf is now officially a Rockmont tradition. We play with official rules and equipment , and our new 18 hole course is a wandering beauty, with plenty of wide open and inviting stretches, as well as treacherous hazards. Eric Beason currently holds (claims) the course record, which is always up for a challenge. 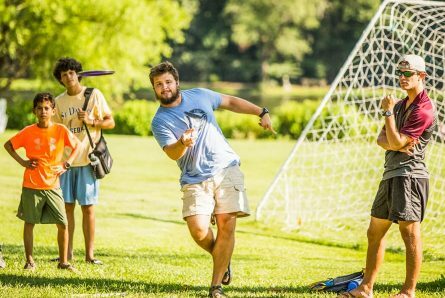 Ultimate Frisbee is another Rockmont tradition dating back many decades. We play it on just about any grass surface, and we often find a way to cool off after a vigorous game. It’s hard to beat a game of Ultimate followed by a Free Swim in Lake Eden. 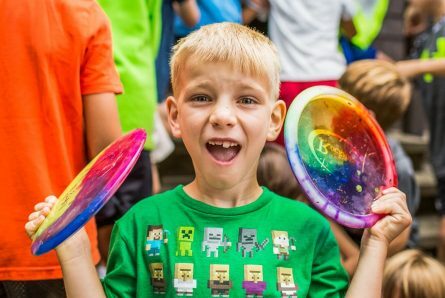 Together Disc Golf and Ultimate Frisbee comprise Disc Sports, one of our most popular and enjoyable skills for all ages. In this fast moving high energy skill, you’ll engage in strength training and cardio workouts while learning safe and beneficial weight lifting fundamentals. In 2019 we added a brand new weight training facility to the Summit Our staff put together a training schedule that you will go through, progressing in various exercise techniques and paces. Move through the Fitness Trail at Rockmont while breathing in the fresh mountain air. All experience is welcome, so whether you’re a gym regular or are looking for some new exercises to explore, our staff meet you where you are. Welcome to fishing in a wonderful, new, and exciting way. Fly Fishing has it all! 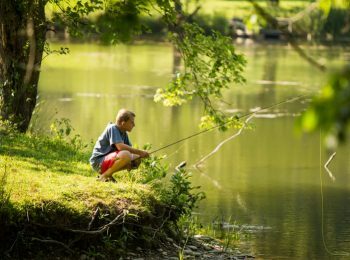 Fly Fishing combines the best of fishing, exploring the outdoors, nature studies, and a developing tactical expertise. Campers will learn how to cast using the Four Priorities of the cast, Power-Patience/Ten and Two. They will also learn several knots, fly selection, types of gear, finding the fish, and how to land the big ones (and the small ones). 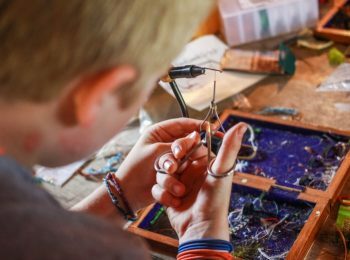 Fly Tying is a creative, exciting, and soulful way to add to the fly fishing experience. The normal evolution of a fly fisher usually includes fly tying sometime along the line. Some do it to save money or learn a new skill. 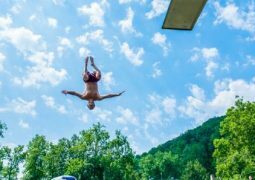 Others want to try it to increase their involvement in the finer details of the sport. No matter what your reasons are, tying flies seems to be an integral part of the whole fly fishing picture. 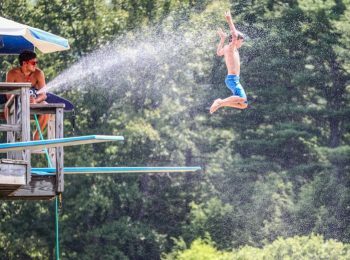 At Rockmont campers will learn the basics of equipment, the process of tying Tail to Head, and then the magic starts. Campers move from big and hairy (wooly bugger) to small and delicate (mosquito) and lots of yet to be named creations in between. Every camper has a chair at the vice so there’s no waiting to get started in this skill. Rockmont’s riding program gives campers the opportunity to form a trusting partnership with a horse. Campers may sign up for the 5-day skill option (i.e. lessons) or the 1-day trail ride. 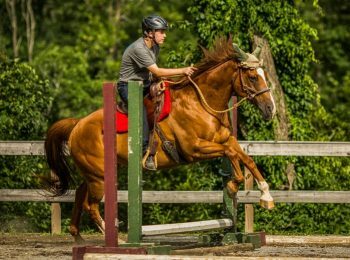 Those who choose the skill option will spend significant time in the riding ring where they receive hands-on instruction appropriate to their skill level and will practice navigating the obstacle course, having developed a strong foundation for riding. They will also spend some time riding our trails. By the end of the session, campers will have progressed in their horsemanship and appreciation for horses and the natural world. Horseback Riding is an excellent confidence-builder. It requires participants to be attentive and aware of what is going on around them. 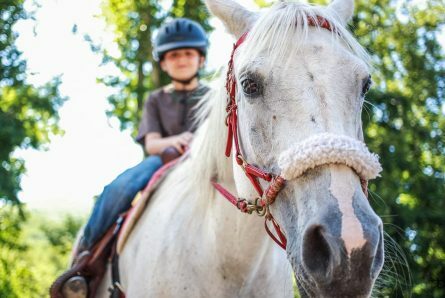 Horseback Riding can be both mentally and physically challenging, and campers are encouraged to participate at whatever level they feel comfortable. There are several ways we ensure a safe experience for our campers during Horseback Riding and trail rides. A questionnaire is sent to campers’ families prior to camp so that our instructor is familiar with each camper’s previous experience with horses. 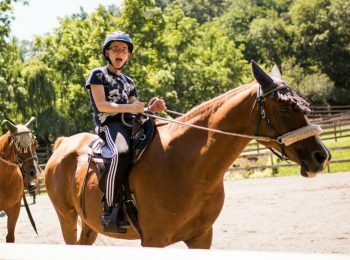 Campers who have participated in Horseback Riding at Camp Rockmont previously are able to progress in those skills they’ve learned. Our Horseback Riding Director works with our horses throughout the year and knows them intimately. This ensures we know each horse’s temperament and allows us to pair horses appropriately with each camper based on personality, skill, and comfort level. Horseback Riding is taught by Sara Boelt. Sara grew up riding horses and has worked with them most of her life. 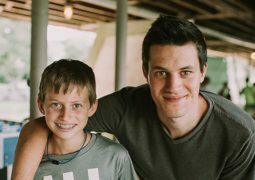 Sara studied biology at Mars Hill College, and now lives at Camp Rockmont year-round, caring for the camp horses. 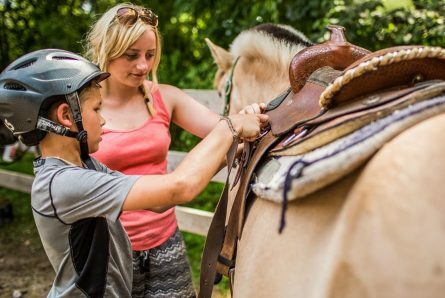 When camp isn’t in session, Sara operates Lighter Mount Horsemanship at the Camp Rockmont barn, teaching riding to local children and some adults as well. She also teaches lessons and trains horses at farms around the area, participates in endurance riding, and occasionally serves as a vet tech with a local equine veterinarian. Lacrosse is one of the most vigorous and intense sports we play. We play on the Lacrosse field, a scenic location just below Inspiration Point and above Mountain Camp. 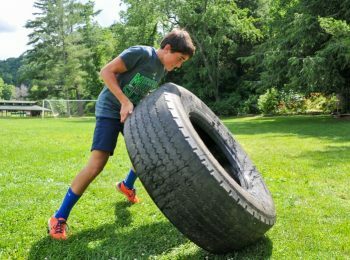 Lacrosse pushes campers to new levels of fitness and athletic achievement. 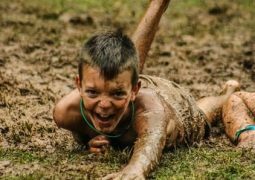 Lacrosse challenges all players to dig down and play hard. 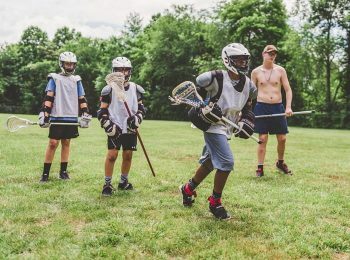 At Rockmont we bring together Lacrosse players from many states, and we take advantage of our staff experience to create a uniquely Rockmont experience. 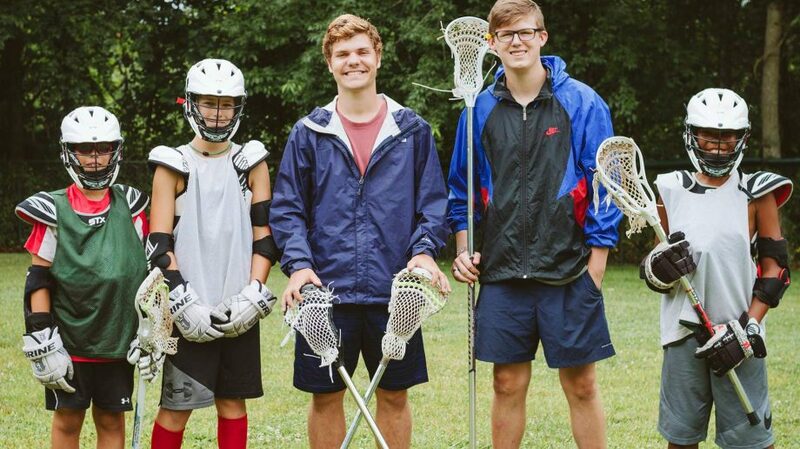 We play hard, and we encourage each other in “the Rockmont way.” Lacrosse has historical roots in the native American Iroquois people from New York and Pennsylvania. To play it on a high mountain field in the southern Blue Ridge Mountains is a truly breath-taking experience. Beginners and advanced players welcome. 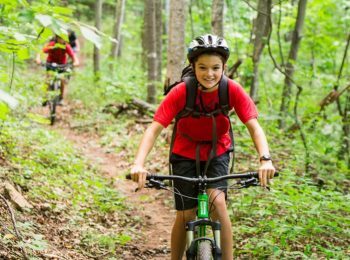 Explore Rockmont’s most beautiful trails, learn bike maintenance and safety, and expand your riding skills. Off camp trips are available also. All skill levels are welcome. Rock climbing at Rockmont is an intense skill. 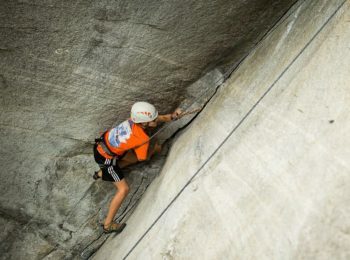 Learn core skills like proper body movement, belaying and rappelling, as well as perseverance and communication. Overcome obstacles, and gain a new perspective of the world on our 50-foot climbing tower and in our lakeside trees. Our ‘pilgrims of the vertical’ master the fundamentals before reaching new heights on rock walls in Western North Carolina. 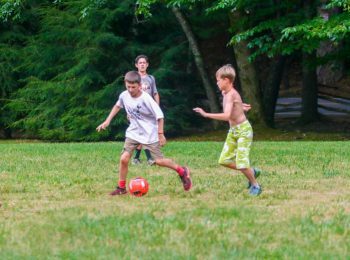 Soccer at Camp Rockmont combines skill instruction with fun yet competitive games and scrimmages to campers of all ages. 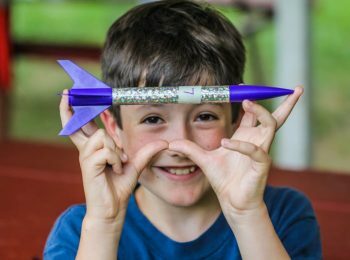 While the primary goal is to have fun, coaching tips are given to facilitate growth. 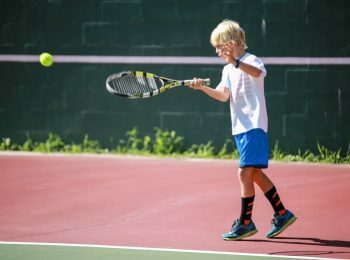 It is our goal to offer guidance and instruction that will help campers play the sport effectively. 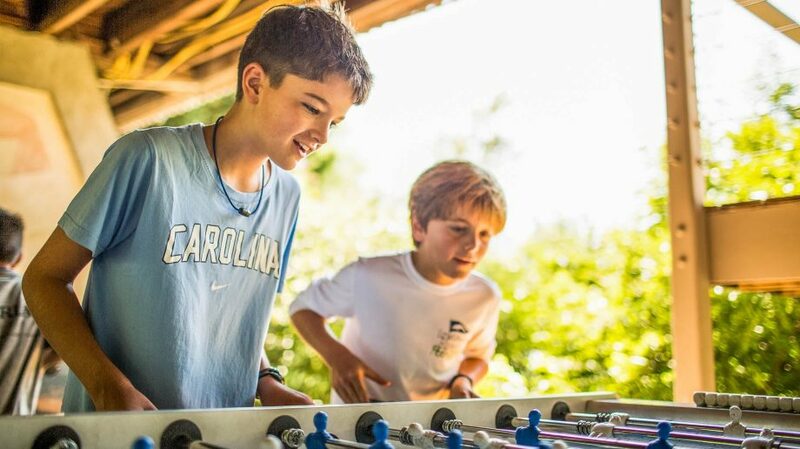 Skill periods are arranged by campers’ age in order to provide similar skill development and appropriate challenge. Skill levels are determined through initial scrimmages, as well as games that take place during Soccer practice. Our aim is to ensure that everyone has the opportunity to improve their soccer skills during these activities, so teams are split up as fairly as possible. 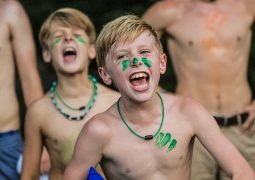 At Camp Rockmont, we encourage all campers to build each other up. 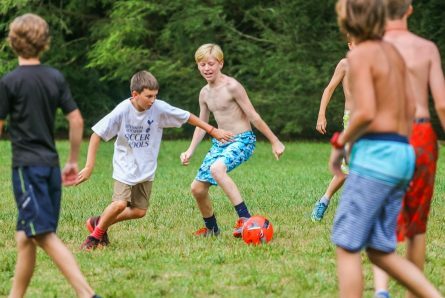 While we do enjoy creating a competitive atmosphere during Soccer games and scrimmages, we also make sure campers know we are all here together at camp to have fun and grow. 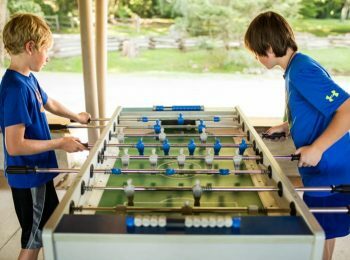 Play ping pong, foosball, and darts in an open-air setting for fun and exciting competitions. These long-standing games offer both a challenge and a freedom to play with little pressure. Test your skills and your winning streak as you compete with the best at Rockmont.